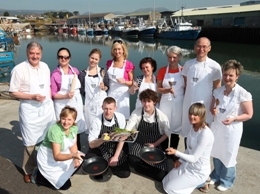 Basic ingredients: Ideally located in the Nautilus Centre, this modern cookery school has impressive panoramic views of Kilkeel harbour, home to Northern Ireland’s largest fishing fleet. Fish fans can learn more about what to look for when buying, handling and cooking seafood. Courses are not restricted to seafood, there are classes on chutneys, chocolate, barbecues (including beer can chicken and BBQ choc cake!) and meat. One hour mini taster sessions for groups of ten or more start from just £15 per person, with half day courses for groups or individuals at £60 and full day courses at £110. Evening classes from £35. They say: We try to source as many ingredients as possible from local producers such as dry cured bacon from Cunningham Butchers, Mourne Oyster Stout brewed at the Whitewater Brewery and seafood (crab, oysters and razor clams) supplied by Mourne Seafoods. We say: The school is a social enterprise which means that any profits made are re-invested into the local community. Its aim is to support the fishing industry and promote sustainable fish species. The Nautilus Centre is also home to the Mourne Maritime Visitor Centre. As well as the sea, the Mourne mountains are a designated area of outstanding natural beauty. The writer C. S. Lewis used to holiday in the area as a child and it influenced his works such as The Lion, the Witch and the Wardrobe.